The guitar's features and playability are just superb, but the quality control seems to have been sleeping the time my guitar passed it. The guitar is very well built, but the satin lacquer has gone bubbles on the end of the neck above the resonator hole, and there is a place on the edge that is left unfinished. 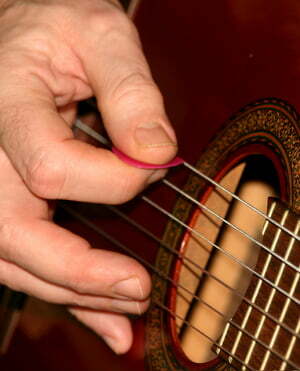 Moreover, i found some lacquer on the strings (!). I wonder if they were put on the guitar right after finish before it dried. Guitar body was all in woodpowder when unpacked - it's definitely from the installation of pickup, and it made a bad impression. The sound is good, but i'll try another strings instead of dirty ones installed - it may turn out to be even better. My appeal to the shop'd managers and to chinese plant managers: pump up quality control! Othe HB guitars i bought were absolutely superb, but this one is designed and built great, but its finish is far from perfect. But even mentioning this, the guitar has no competitors with its features (solid top+narrow nut+strong design). I am mainly an electric player into Jazz but had been looking for a nylon string guitar for Bossa Nova and came across this HB model which has the smaller nut width of 48mm which I though would help my short fingers so I decided to go for it. The guitar cannot be faulted. No fret buzz, level frets although needing a little polish, not rough fret edges. I decided to fit D'Addario EJ45LP strings as I will do anything to reduce string squeal but I believe this guitar comes fitted with a good quality D'Addario string set as standard. I cannot comment on how this guitar sounds side by side with similar guitars but the tone to me sounds great and the under saddle Fishman pickup works really well. So if you are looking to add a nylon string model to your arsenal then this guitar could be a good way to test the water without breaking the bank. Certainly the narrower nut width may help players transitioning from electric. ID: 334573 © 1996–2019 Thomann GmbH Thomann loves you, because you rock!